Utilize our 40 years of experience for your commercial real estate leasing needs in the Valley of the Sun. To find available properties click on the appropriate field under "Categories" in the lower left area of this page (scroll down for the full list) or click here for a map view. 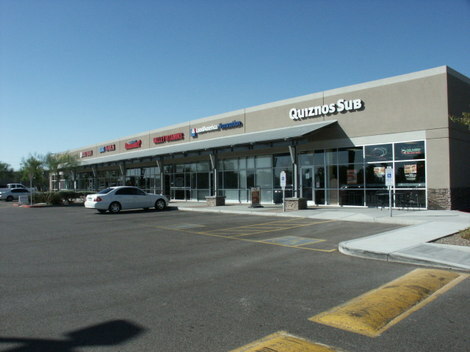 1974 sq ft former Quiznos space in Foothills Vista Commons shopping center just west of I-10 freeway. Located on the NE corner of Chandler Boulevard & 48th St. in Phoenix, solid anchor tenants such as LA Fitness, Tutor Time. 400 sq ft space, great for an additional location for a small existing or for a start-up business. SE corner of 24th St. and Osborn just north of Thomas, easy access from Hwy 51, large parking lot in back. 2000 sq ft high visibility endcap space, formerly Europa Bakery and Cafe just north of Bethany Home Road on 16th St. just west of 51 Hwy. Small hood with Ansel system and water heater. 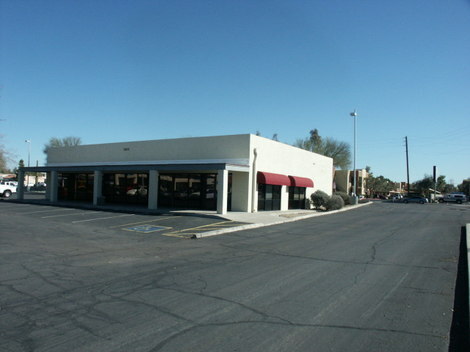 1300 square foot space in Ahwatukee Foothills, neighbors include LA Fitness, Tutor Time, T-Mobile and Spinatos Pizza. One half mile west of I-10 freeway, Chandler Blvd exit, NE corner of 48th St. and Chandler Blvd. 1171 sq ft space in small mall at SE corner of 51st Ave and Olive. Former job assistance center, built out as office spaces and reception area. 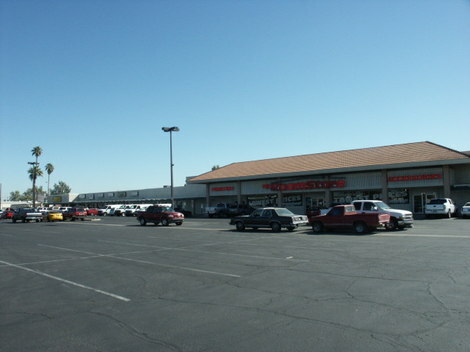 1334 sq ft endcap with drive-thru on SE corner of 51st Avenue and Olive in neighborhood mall for less than $ 12.00/ft NNN. Perfect for convenience or liquor store with Subway as a neighbor. 23,800 sq ft. north-facing anchor space formerly occupied by The Room Store, entrances shaded all year. Center is 90% occupied, this space is in the middle of the building, located on the SW Corner of 35th Ave & Northern with Jack in the Box restaurant on immediate SW corner and JB's Restaurant to west of Jack in the Box. Approx. 1/3 acre fenced storage lot on 17th Road just south of fairgrounds at Indian School Road and 19th Avenue. Great for company vehicles, long-term RV parking or materials storage. 2600 square foot former deli at busy traffic lighted SE corner of 7th and Missouri Avenues. Reach-in refrigerator with 10 glass doors, 3 deli cases, 2 display cases, vent hood for stove. Pole sign on corner included. 1200 sq ft space at The Room Store Plaza, a major shopping center on the SW corner of 35th Ave and Northern with tenants such as Burger King and JB's. Unit faces north providing entrance shade for customers and tenants year round. 800 sq ft space next door to CVS Pharmacy on the NW corner of 43rd Avenue and Bethany Home Road. Plenty of parking in both front and back, spaces for your business name on both the fronts of the suites and on lighted sign fronting 43rd Avenue. 3800 square foot endcap space along the Light Rail transportation system bringing more traffic to the Central Corridor. Just south of the intersection of Central and Camelback, just north of Brophy Prep School and across Central Avenue from the Landmark Tower condominiums. Currently occupied but tenant desires to discontinue business once a new lessee is secured. 1200 square foot retail space along Light Rail transportation system bringing more traffic to the Central Corridor. Just north of Brophy Prep and south of the intersection of Central and Camelback near Hula's and M&I Bank. 3600 sq ft space at SE corner of 24th St. and Osborn. Large windows in front for good visibility plus separate room in back for ease of product storage in addition to large parking lot in back of building. Easy access from State Route 51, space at left behind white vehicle. 3500 sq ft retail space located south of Camelback Road on the west side of 7th Ave. East exposure and nice overhang over sidewalk ensures shade on the front door and windows all year long. Plenty of parking with good curb appeal. 3484 sq ft highly visible end-cap showroom-style space in Foothills Vista Commons shopping center just west of I-10 freeway. 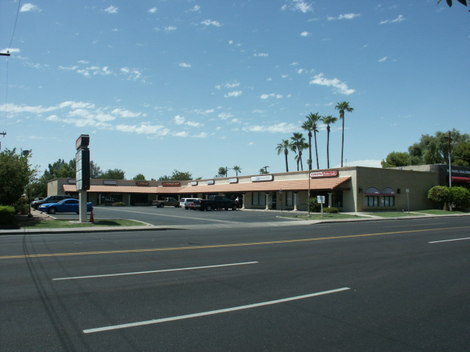 Located on the NE corner of Chandler Boulevard & 48th St. in Phoenix, solid anchor tenants such as LA Fitness, Tutor Time. 670 sq ft space in a small neighborhood center, perfect for startup businesses or additional location. Fast and easy access, exit Thomas east off State Route 51 then south of Thomas on 24th St.
625 sq ft space, great for an additional location for a small existing or for a start-up business. SE corner of 24th St. and Osborn just north of Thomas, easy access from Hwy 51, large parking lot in back. 1200 sq ft space in Central Corridor just south of Camelback Road along Light Rail, across from Hula's restaurant and next to San Xavier church and Brophy Prep School. Space on pole sign is included in lease rate. 3180 sq ft main building with 3 bays along with two 400+ sq ft separate buildings at high visibility corner of Cave Creek Road and Cheryl Ave. Zoned C3. Currently leased from October 2014 to September 2016 at $ 2600/mo. , tenant pays electric and water, owner pays property taxes or insurance. Owner may carry with 30% down and solid financials. 2014 taxes: $ 6,894.62 2014 Insurance: $ 1171/yr. 1200 sq ft. former chiropractor space in small neighborhood mall off 16th St. north of Maryland St. Space is on right when pulling into parking lot, plenty of parking in back of building. 900 sq ft space at The Room Store Plaza, a major shopping center on the SW corner of 35th Ave and Northern with tenants such as Burger King and JB's. Unit faces north providing entrance shade for customers and tenants year round. 1200 square foot former beauty salon facing east on 43rd Avenue just north of Bethany Home Road. Generous parking in front and back with large windows, space for signage on both the front of the space and lighted pole sign on 43rd Avenue. 1900 sq ft space retrofitted with upgraded lighting, a single door and double door entry, plus 2 bathrooms high ceilings and newer 30 gallon water heater. Perfect for small gym, pilates or fitness business. 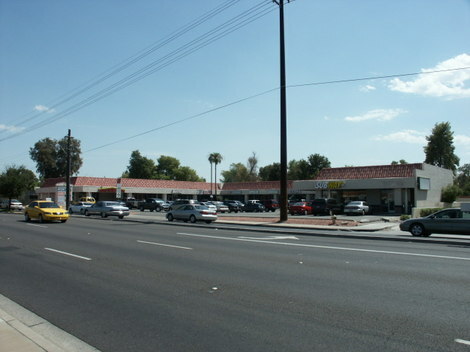 Plenty of parking, property located on the busy main Phoenix thoroughfare of 24th St. Easy exit east off Hwy 51 at Thomas then 1/2 block north to property on east side of 24th St.
1200 sq ft open space in Central Corridor just south of Camelback Road along Light Rail, across from Hula's restaurant and Landmark Towers, next to San Xavier church and Brophy Prep School. Space on pole sign is included in lease rate. 1680 sq ft space on SE corner of 24th St. and Osborn, an open floor plan. Stoplight at 24th & Osborn will slow or stop traffic for good visibility, large parking lot in back of building along with parking in front of spaces. Easy access from State Route 51. 565 sq ft just off State Route 51 and south of Thomas Road on 24th Street, this property is exposed to high street traffic with plenty of parking and good signage. 960 square foot retail space along Light Rail transportation system bringing more traffic to the Central Corridor. Just south of the intersection of Central and Camelback near Hula's and across from Landmark Towers. Space is third window from right in above photo. 1 or 2 spaces for lease, 1640 sq ft which may be split to into two 820 sq ft spaces. Just off State Route 51 and south of Thomas Road on 24th Street, this property is exposed to high street and foot traffic with plenty of parking. These spaces have been leased, contact us for others available. 2400 and 900 sq ft spaces opened to each other located on busy 24th St. with plenty of parking. Easy exit east off Hwy 51 at Thomas then 1/2 block north to property on east side of 24th St. 3043 has double-door entrance, pole sign on 24th St. included with this space. Spaces have retrofitted lighting to meet modern standards. 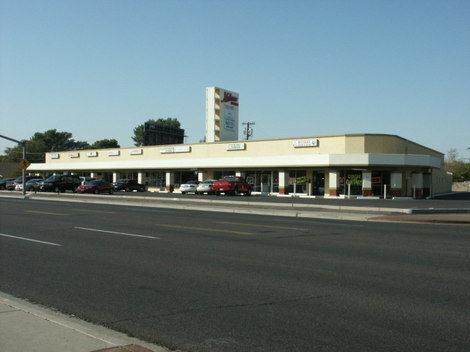 2400 sq ft. fully equipped endcap restaurant at Roomstore Plaza on the SW corner of 35th and Northern Avenues. Plenty of visibility with large signage on building plus monument sign and great parking. Entrance to space faces north affording year-round shade. Vietnamese restaurant business in place is for sale along with equipment and furnishings. 1508 sq ft endcap fronting busy 24th St. Just off State Route 51 with generous parking and great visibility, pole sign space and 3 lit signs on building. Building for office and car/truck repair facility with 19 parking spaces and/or 85 space parking/storage area. Large parking area to be used by owners 2 weeks in late October for County Fair. Located just south of the Fairgrounds with access from both 17th Drive and 17th Road. 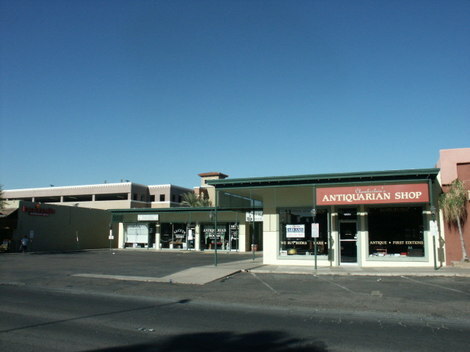 600 square foot retail space on bottom floor in quaint, quiet area of Scottsdale. Perfect for a small or start-up business venture or expansion from a home to a new location. 3975 sq ft indoor plus 1012 sq ft covered patio at the gateway to Ahwatukee Foothills. This great endcap on NE corner of 48th St and Chandler Blvd is perfect for a sports bar, tavern or fun place to unwind. Available Fall 2010, earlier occupancy negotiable. Combined square footage at $19 a foot! 2500 sq ft open space with kitchen and office area, great for church or gathering place. On SW corner of 35th Ave and Northern it faces 35th Ave at far left in photo above. Large parking area in back. 1800 square foot space, the result of combining two 900 square foot spaces into one. Major shopping center at the SW corner of 35th Ave and Northern with anchor tenants such as The Room Store, Jack In The Box and JB's. Space faces north providing entrance shade for customers and tenants year round. Auctions are held when a Landlord's Lien upon the Lessee's property within a leased space has failed to gain proceeds from the Lessee after 60 days' relief period resulting in the auction of the Lessee's property. There are no auctions in progress or upcoming at this time, when they are this post will be at the top of the home page.